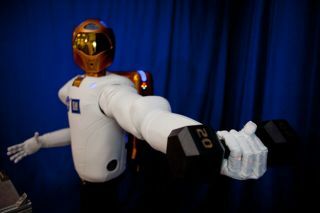 Robonaut2 surpasses previous dexterous humanoid robots in strength, yet it is safe enough to work side-by-side with humans. It is able to lift, not just hold, this 20-pound weight (about four times heavier than what other dexterous robots can handle) both near and away from its body. The next generation of robot astronauts is on its way, andthey are even faster, stronger and more dexterous than before. NASA and General Motors have unveiled Robonaut2, a more advanced version of the original Robonaut built 10 years ago in apartnership between NASA and the Defense Advanced Research Project Agency. Itsnickname, "R2," bears a striking resemblance to Star Wars' R2D2 ? "a similarity we've noticed," said Ron Diftler, NASA's Robonautproject manager. This new humanoid machine, developed and built with the helpof engineers from Oceaneering Space Systems of Houston, is more dexterous, witha four-jointed thumb as opposed to three, enabling it to do work beyond thescope of prior humanoid machines. "The thumb is obviously important,helping make us the dominant species on the planet," Diftler said. Therobot's thumb "has roughly the order of flexibility of an astronaut in aspacesuit glove." R2 is also four times faster than the original Robonaut,capable of moving roughly 4.5 mph. It is stronger as well, able to lift 20pounds of weight, about four times what other dexterous robots can handle. To make it work safely alongside people, "we put inmore force sensors both on a joint and arm level, so if it comes into contactwith astronauts unexpectedly, it can stop or completely shut down, depending onthe force level it sees," Diftler explained. The roughly 300-pound robot,whose proportions are about that of a large human's, is also covered in softfabric, to help cushion it in case it comes into contact with people and coverit so that it doesn't accidentally rip spacesuits. These advances could help R2 manipulate flexible materials.The idea is to relieve the astronaut crews of the burden of tasks such assetting up thermal blankets or fetching tools in place. "Our goal is tohave astronauts do more science and exploration," Diftler said. The researchers developed the robot as a humanoid"because when your main objective is to help astronauts, you want therobots to work with the same tools and interfaces that humans do, which lendsitself to machines like human hands, with a similar reach when it comes toarms," Diftler explained. "Continuing along that track, you end upwith a humanrobot." R2 can be tele-operated, "but the method we propose foroperating it is what we call supervised autonomy, where from the ground, therobot can be given a sequence of commands, and after it completes each sectionof the command, activity can be verified from the ground's camera view beforeit moves on to the next part," Diftler said. "That way you can workaround the time delay between Earth and space, which is a big problem withtele-operation." The astronauts can also operate R2 from inside theirspacecraft if necessary. NASA and GM began working together on R2 three years agothrough a Space Act Agreement, with GM contributing an undisclosed amount offunding to the research, producing one robot for GM and another for NASA. NASAand GM have long been partners, starting in the 1960s with the development ofthe navigation systems for the Apollo missions. GM also played a vital role inthe development of the Lunar Rover Vehicle, the first vehicle to be used on themoon. These robots hold promise on Earth as well as in space ?they can help to build cars and assist astronauts during hazardous missions,too, the scientists say. "For GM, this is about safer cars and saferplants," said Alan Taub, GM's vice president for global research anddevelopment. "When it comes to future vehicles, the advancements incontrols, sensors and vision technology can be used to develop advanced vehiclesafety systems. The partnership's vision is to explore advanced robots workingtogether in harmony with people, building better, higher quality vehicles in asafer, more competitive manufacturing environment." "This cutting-edge roboticstechnology holds great promise, not only for NASA, but also for thenation," said Doug Cooke, associate administrator for the ExplorationSystems Mission Directorate at NASA Headquarters in Washington, D.C. Given the uncertainty currently surrounding the status ofNASA's human spaceflight program, it remains unknown when R2 might see use. R1was never approved to go on a space mission. "My hope is to get R2 inspace as soon as possible," Diftler said. Video - Protecting Space Robots...From People!